The first US rocket to reach outer space (Bumper 5) is launched from the White Sands Proving Grounds in New Mexico. 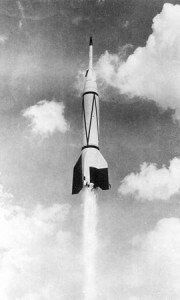 The rocket was a modified German V-2 ballistic missile. It reached a record altitude of 244 miles, which broke the unofficial record of 117 miles, reportedly set by a V-2 missile launched by Germany in 1944. The later named and established Kármán line, which is 62.1 miles (100 kilometers) above the Earth’s sea level, is considered the upper limit of Earth’s atmosphere and the beginning of Outer Space.